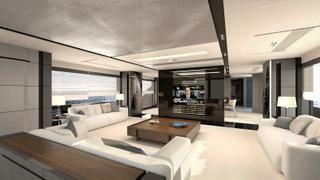 Turkish studio Scaro Design has released its latest concept for a 38.35 metre motor yacht. 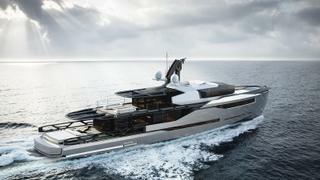 The AEON 380 is part of a new range called AEON Yachts, which could eventually stretch up to 46 metres. This two-deck cruiser would feature a hull and superstructure both built using a glass-reinforced epoxy sandwich construction method. 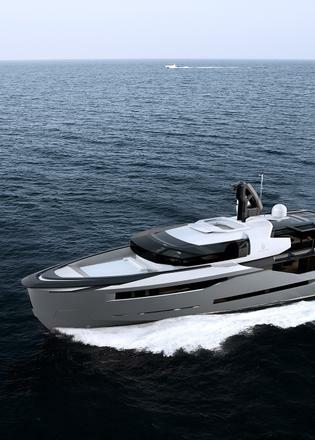 The sharp exterior lines are immediately reminiscent of some of Scaro Design’s most successful projects, including the Peri Yachts range, as well as luxury car design. Accommodation is for up to 12 guests split between five cabins, including an owner’s cabin on the main deck as well as two VIP suites and two twin cabins with Pullman berths on the lower deck. Meanwhile, the crew quarters allows for a staff of 10 people sleeping in five cabins, all situated in the bow area. Al fresco relaxation areas on board the AEON 380 are plentiful, with large sunbathing spaces both on the foredeck and in the cockpit. The superyacht sundeck is split between an enclosed upper saloon and an al fresco lounge area with built-in seating. Moving inside and the main-deck saloon features a bright, minimalist décor, benefitting from large expanses of glazing in the superstructure. Guests can choose to relax on three large sofas, while a more formal dining area is situated further forward. Power would come from a pair of 1,900hp Caterpillar C32 ACERT engines that would give the AEON 380 a cruising speed of 18 knots, topping out at 20 knots. What's more, her total fuel capacity of 40,000 litres would allow for a maximum cruising range of 2,250 nautical miles.